To add a set of slides to the plan, click on the Presentations bar in the Library. If the slideset you want is listed, click on it and then on the ⊕ symbol to add it to your plan. Then click on the disk symbol just below the P of Presentations and navigate to the file you want to import. Once you have added it to the library you can add it to your service plan using ⊕ . You can't edit slides from within OpenLP. 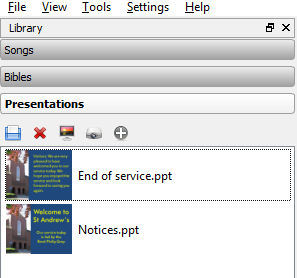 Instead, on the desktop of the church laptop there are links to Notices and End of Service which you can use to open them in Powerpoint, edit them and save them. Once you have edited a slideset, you must delete it from the Presentations section of the Library and also from the current service plan; then add it again to the Library and from there add it to the service plan. OpenLP can handle slidesets in Powerpoint (.ppt or .pptx), Impress (.odp) or PDF (.pdf) formats. It cannot currently handle Apple Keynote slide format, but can handle a PDF presentation saved from Keynote. Make sure that the slides’ aspect ratio (ie width to height ratio) is 4:3 and not 16:9 (widescreen) or any other value. In Powerpoint this is set in Design → Page setup → On-screen show (4:3) and in Impress Slide → Slide properties → Format: Screen 4:3. The church is a large, bright building and the contrast on the screen is poor, especially on a sunny day. 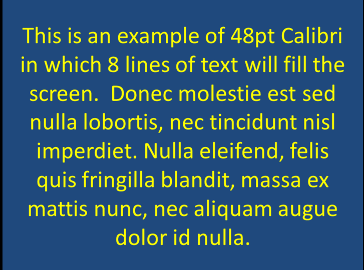 For best results choose a text size such that a maximum of 8 lines appear on the full height of the screen - typically around 48pt. The best fonts are thick-stroke sans-serif ones such as Calibri, Arial, Helvetica or Open Sans. Light text on a dark background is more legible than the reverse: either white on black or yellow on dark blue. The resolution of the projector is 1024x768 pixels. For best results photographs should be scaled appropriately. Dark photographs will show better if the contrast and brightness are increased using a photo-editing tool such as Gimp.